I can honestly say that I simply love Persian Kotlet. They are so incredibly good! This is one of those Persian dishes that can be served warm or cold, at home or at a picnic. To be honest though, it is not something that I make often because it is not only labor intensive but also because it require some serious frying. Nevertheless, it is one of those types of food that when I make it is such a treat. The ingredients are few and simple. I simply love biting into them where the outside is nice and crispy and the inside deliciously soft. 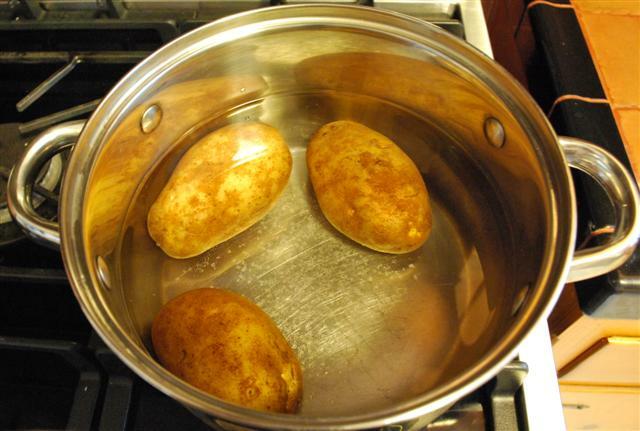 Place potatoes in a pot, cover with cold water, add some salt, and cook until a fork easily goes through. Grate onion. You may possibly wonder what the heck in the candle in the background is all about. I have very sensitive eyes. Onion cutting = tears for me. I think I saw this Alton Brown’s show where he suggested having some type of flame close by when cutting onions. It works for me, for the most part. Once your potatoes are done they need to be peeled and mashed. You see this little nifty kitchen tool? I so love it! This Food Mill was given to me by Goli, one of my 10-20 times removed cousins, as a birthday present a few years back. I also love it because it remind me of my Grandma’s kitchen as she owned one of these and used it frequently. 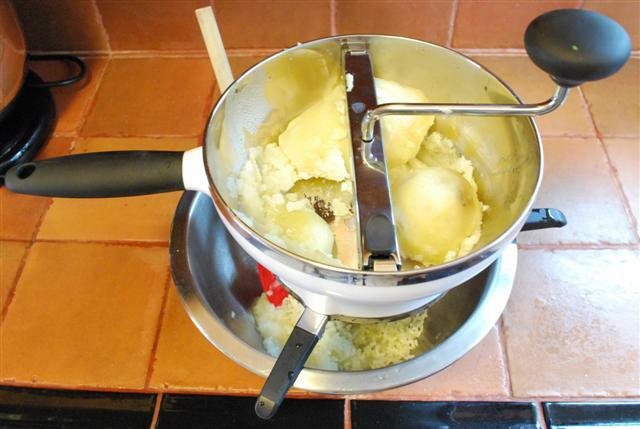 This is by far my favorite way to make mashed potatoes. No lumps and the texture is nice and silky. Ya see this other awesome kitchen tool? I so love it too. 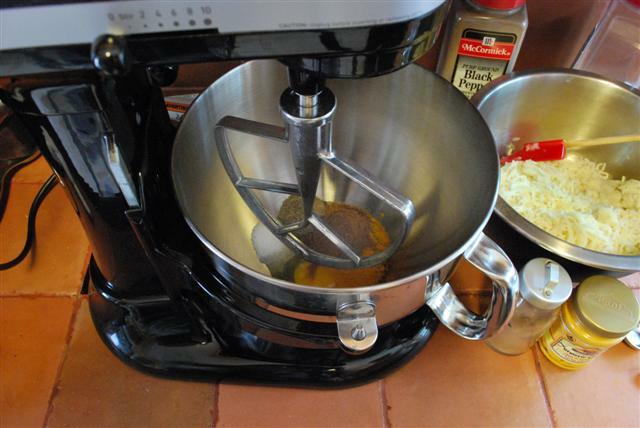 You may have noticed that I use my KitchenAid mixer pretty frequently as it makes mixing so much easier. 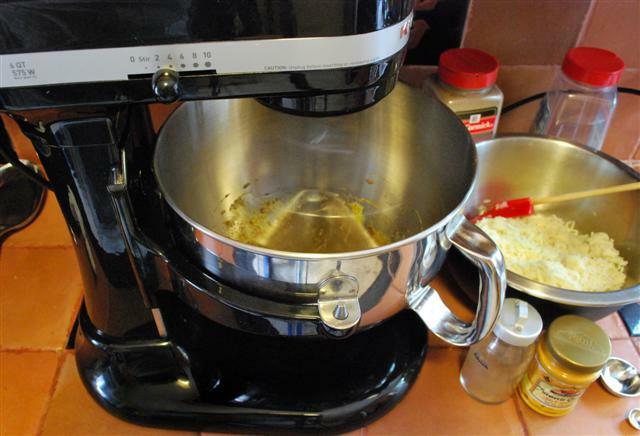 Place turmeric, advieh, salt, and pepper in the mixer. Add eggs and give it a nice mix. Mix well until all the ingredients are nicely incorporated. Now here comes the fun part! Take a small amount of the mixture and make a small ball out of it. 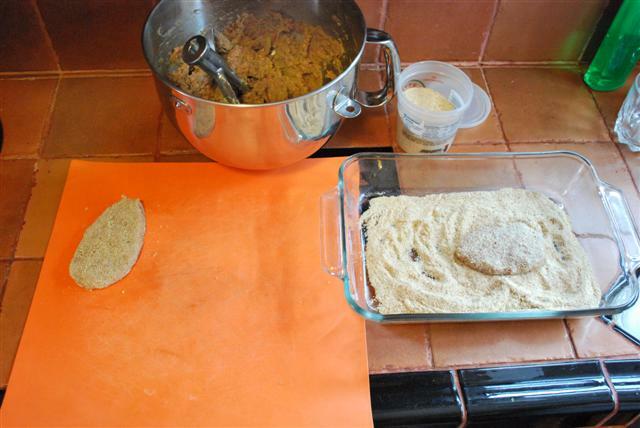 Place breadcrumbs in a dish. 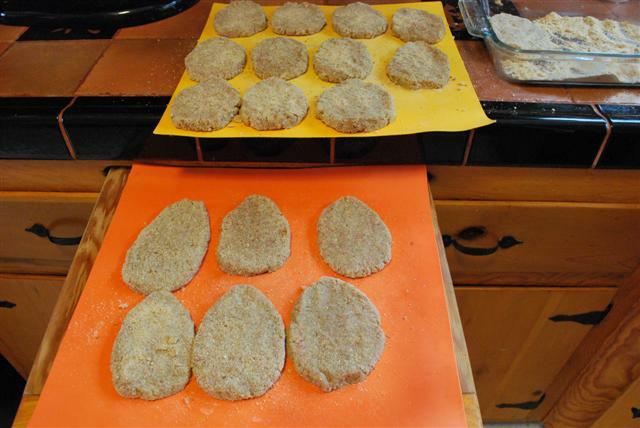 Then coat each Kotlet with bread crumbs. In theory all Kotlets should be the same size and thickness. Can’t say that I am very good at making everything look the same size and shape…but I sure try hard! Anyway, I got 18 pieces out of this recipe. The 18th one is in the dish for inquiring minds! 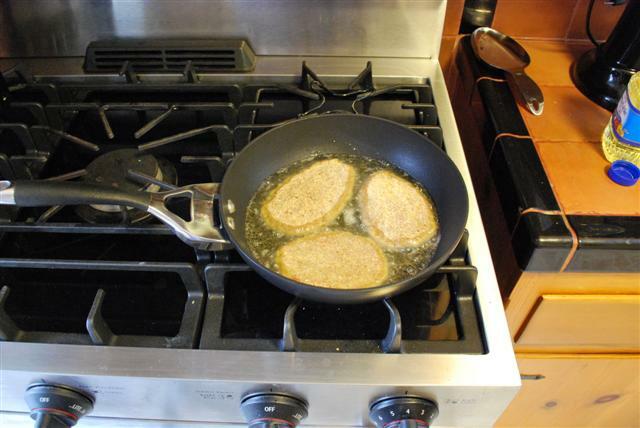 Warm up some vegetable oil in a non-stick pan. Fry a few Kotlets at a time making sure that you don’t crowd them. Once you see that the bottom has turned into a nice golden color flip them over. Add more oil as necessary. 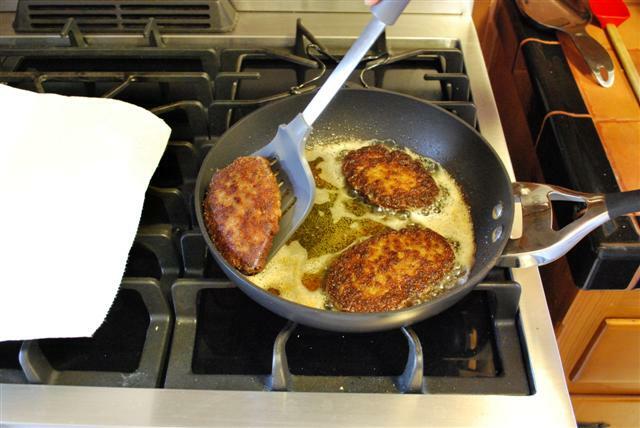 Place a dish with a papertowel in it next to your frying pan. 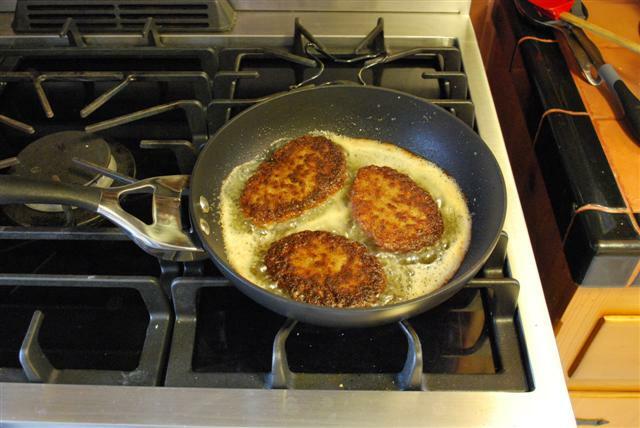 When removing the Kotlets from the pan try to drain as much as the oil as possible. Then place onto the plate. 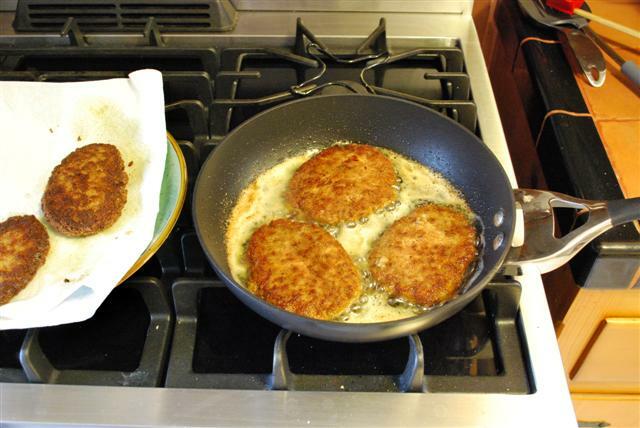 Continue frying the Kotlets until they are all a nice golden color and crisp on the outside. Ya see how one Kotlet is missing one the left? There used to be three there…until I ate one ’cause I could not resist waiting until the others were all done! To keep the ones that you have made warm, place the plate in your oven. As a tip to keeping these wonderful persian treats nice and crispy remember to not cover them while they are on the plate, as this will only trap the steam coming off of them and make them soggy. Doing this may be a bit of a trick as each plate paper towel can only comfortable hold 3-4 Kotlet each, but if you are planning on eating them shortly after cooking it is well worth the extra room taken up in the oven as they will stay nice and crispy on the outside and soft and warm on the inside. 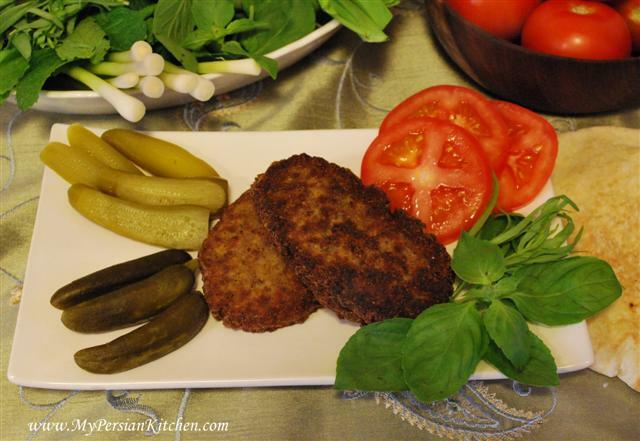 You can serve Kotlet with some Persian Sabzi, fresh herbs, a few slices of tomato, and Persian pickles. Or you could make a nice sandwich out of the whole thing. I used half of a Pita bread. You can use any type of bread. A Kotlet sandwich is particularly delicious in a French Baguette. Lastly, I would like to leave you with a nifty YouTube video that I found some time ago. Ever wondered how to peel a potato quickly and effortlessly? I hate peeling potatoes and after I saw this video I had one of those “WOW” moments! I haven’t tried it yet, but I sure will. Gilligan’s Island fans will get a kick out of this one! Looks delicious! I am also having some serious Kitchen Aid envy right now! I know the feeling Sheila! That’s how I felt about everyone else’s KitchenAid before we became to proud owners of ours!!! 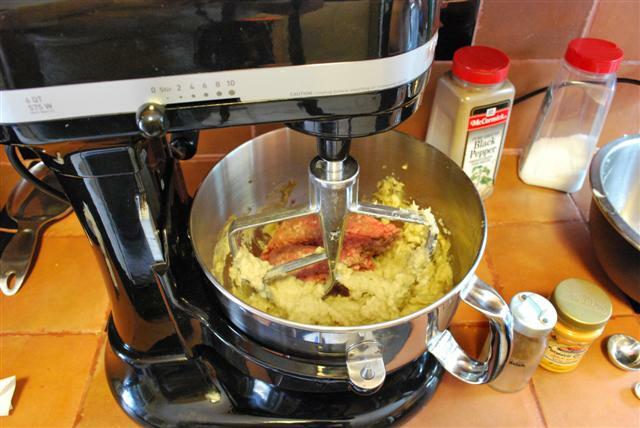 The KitchenAid has a funny story of its own…I must tell that story one of these days! Thanks for posting this recipe. It’s one of my favorite dishes. My Great Aunt would make this for us. She would use ground chicken instead of beef. Also, she would separate the egg whites from the yolks. She would mix the meat with only the yolks (and the rest of the ingredients), beat the egg whites until they were foamy and fold them into the meat mixture afterwards. She said it make the kotlet lighter. Not sure if that’s true because I haven’t experimented. Seems logical though. Keep up the good work! I can only imagine how much better these would be the way you described it. Now you got me all inspired and I need to make them to see for myself. Thanks for all your little tips! Keep them coming! I was going to try this recipe this weekend. 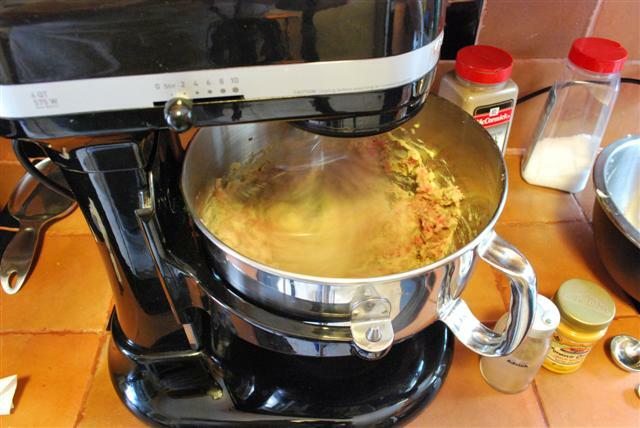 I borrowed my Mom’s Kitchen Aid thing to grind the chicken meat, but I can’t figure out how it works! My Mom tried explaining it to me over the phone, but no dice. Maybe the butcher will grind the meat for me. Another thing that my Great Aunt would do, was instead of potatoes, she would soak white bread (no crusts) in milk, then drain it very well and pass it through the meat grinder (she said an added bonus to this method was that it made it easier to clean the grinder). My Mom uses potatoes like you do. I prefer the potato. I didn’t think to add turmeric to this recipe, I’m going to give it a try. Thanks! Thanks for the YouTube link – very cool. No more peeling tons of potatoes for Salad Oliveh. P.S. Noting beats a kotlet sandwich for lunch the next day!! I am a big fan of Persian food, and I LOVE all the beautiful pictures you put here to show the process. This is the best recipe ever. Thanks for your kind words. I love hearing from my readers and it encourages me to keep on going strong!! I love kotlet. Any suggestions on a vegetarian way to make this? Also, some people use shredded raw potatoes–supposedly absorbs less oil? Never tried it though. Yes! I do have a vegetarian version of kotlet which I will post soon! Thank you so much! Looking forward to trying it out! The pictures look so yummy! 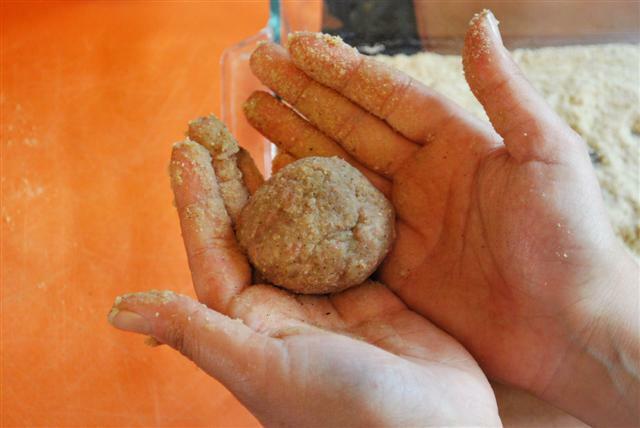 I am making this Persian Kotlet recipe today and I wanted to be sure the advieh measurement on the recipe is correct (1 1/2 Tablespoons). I only ask because I followed the recipe on your blog for making the advieh, and I think that is about how much advieh the recipe made. So I was wondering if I use that much or not. yes, that’s how much advieh I used. You can use less if you like. Alternatively, you can double the recipe for the advieh should you wish to make more. Well I made the Kotlet..while hubby said it was good…he said it was not at all like his mom made…he said for sure there was no advieh in it…just salt and pepper and that he remember the potatoes being shredded as opposed to mashed…and never used bread crumbs….is this a regional dish that could have many different recipes like my ill fated Halvah …..he was born in Tehran..
How did you last Halvah try go? 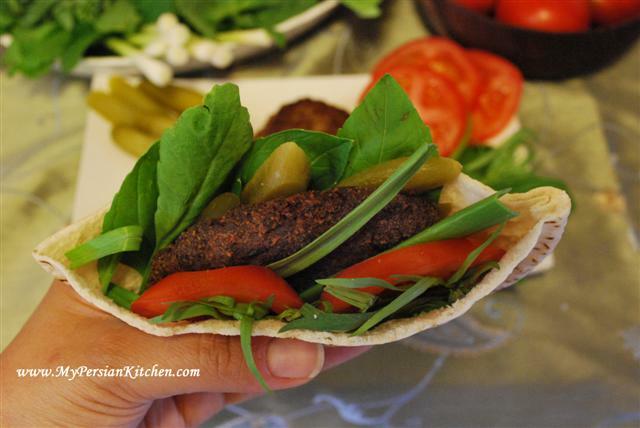 I was really excited to find your blog because I love eating and cooking Persian food! Unfortunately I never paid attention when I was younger when my grandmother lived us so I didn’t learn how to make Persian food from someone who I consider a true master in the kitchen. But as an adult I have learned on my own how to make it through asking my relatives and various cookbooks and websites. One thing I try to do is kind of make it my own by finding a way to make it healthier. 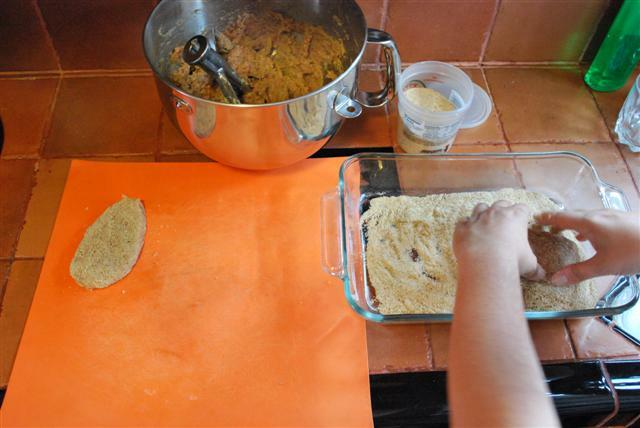 Do you have a recommendation on how to make kotlet (which I adore!) without frying it in oil? Is it possible to bake it? Lili, I have often thought about baking kotlet to see how it comes out. Just like you I love it, but seldom make it because not only it’s time consuming but also because there is lots of frying involved. The one thing that I have done though to make it a bit healthier is to use ground turkey in it to make it less fatty. I would say go heard and try baking it and see how it comes out! I just tried this recipe last week and I loved it! I really love how you put the photos up along with the recipe it really does help. My husband is Persian and I decided that I really need to learn how to cook it, so last week I surprised him by making Kotlet. Although the texture didn’t come out as good as I thought and I know it was because I mashed the potatoes way too much! But other than that he was so impressed by my cooking, I’m going to be cooking Persian again actually the next time will be for Norouz dinner at our place with his whole family! Wish me luck! I put a couple of Kotlet in the oven to see how they would turn out as I wanted a lesser fat alternative as well, they still tasted great but they just didn’t have the nice browning color the frying has but still good. Clorinda, great job! I am so happy that I am part of your adventures in Persian cooking. It’s so nice of you to want to cook Persian food for your husband and his family!!! Keep going!!! Thanks for sharing the recipie. My copy of In a Persian Kitchen is temporarily missing and I needed a recipe for Kotlet. I made a few modifications to compensate for what I had. I used part of a Vidalia onion, they are pretty big. I baked the potatoes in the microwave to keep from getting another pot dirty and to reduce time. I did not have advieh or turmeric so I used a little prepared mustard and salt and pepper. I made bread crumbs out of 6 slices of stale bread because that is what I had on hand. All in all they turned out very well – they were a big hit. David, so glad to hear that managed to make a great recipe out of whatever you had!! Keep cooking! Great recipe and pics, my mom is out of town and i was craving kotlet lol so your recipe helped me out and it was delicious. As someone else mentioned theres different ways to make it, my mom shreds the potatoes and also saute tomatoes and peppers on the side..Either way it was great thanks!! i love your website and was so glad to see that you added kotlet! it is one of my favorites!! 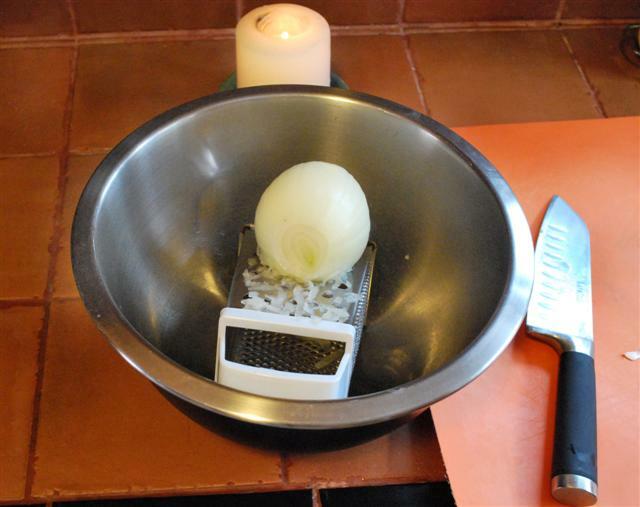 Another tip for dealing with onions is to rinse them in cold water after to make the first cut. i saw that on the brady bunch actually but it definitely works! Sheila, that’s funny that you learned that on the Brady Bunch. I am going to have to try it out!!! I am making these as I write and they are falling apart!! I followed the recipe…what could I be doing wrong? Andrea, was there too much juice in your grated onion? I drained it before adding it….my persian friend said my the ground meat I was using had too much fat…is that possible? I am going to attempt again over the weekend. Andrea, Oh that was going to be my next question!! Yes, the type of ground beef used make a difference too. God bless you, it was tasting like my mom’s kotlets. I am a big fan of your website. It is alwys nice to see how other folk make our loved and well tried dishes too. We use much the same ingredients, but omit the potato. Although my mother include it ocassionally. We also substitute mild curry powder instead of the turmeric, though I feel the latter would do just as well. Now there are other minor differences elsewhere … we include dried mint and fenugreek but exclude advieh. Have you tried it hot in a pitta bread or lavash bread, almost like a sandwich with some fresh mint and spring onion? A childhood favourite of mine which continues to this day. We generaly polish off the meal with some fresh fruit and follow it with a nice cup of our favourite blended tea … ”high tea’ from The Tea and Coffee Emporium. Hi, just wanted to say that I think this website is great! I learned to cook in Iran, lived there for 7 years, there are many ways to cook Kotlet but I have to disagree about the bread crumbs, deffinately was never taught by my family who are amazing cooks to use bread crumbs, I believe it just makes it too heavy and not cooking the potato I find is heaps better. Hi, So I looked through the comments above, and even though you had a question about the amount of advieh, I have to ask it myself. Background, I’m a chef, but I am not Persian. I do however work at the Golestan Center in Berkeley where I’m expected to cook Persian food once a week (the rest of the week is varied). I made this recipe and my very Iranian boss said that it tasted great, but didn’t taste Persian. I showed her the recipe and she thought that the amounts of Advieh and Turmeric should be swapped one for the other. And that the yellow color and flavor of turmeric should be the prominent flavor. PS feel free to email me if you’d like more information. Chaz, the one thing that I have learned from doing research about Persian food when asking people for recipes and pretty much publishing this blog, is that each person makes their food according to their taste. I have come across many recipes which people swear their way is the best way and the next person’s use of a certain ingredient is absolutely wrong. Persian recipes often also vary depending on the region from which each family comes from. It may very well be that your bosses family made use of turmeric in larger amounts than advieh. I have come across people who make their Kotlet with neither. I hope this helps. Can Kotlets be deep fried? My fiancee had them once and he said they were dense and mostly crunchy. I tried your recipe which I thought it was delicious, but he says the consistency was off. Any ideas? Somer, I suppose they could be. My experience with Kotlet is that when they come right off the pan they should be crunchy on the outside and mushy on the inside. Of course the crunchiness will decrease as they sit waiting to be eaten. Thanks so much for your fabulous recipes. 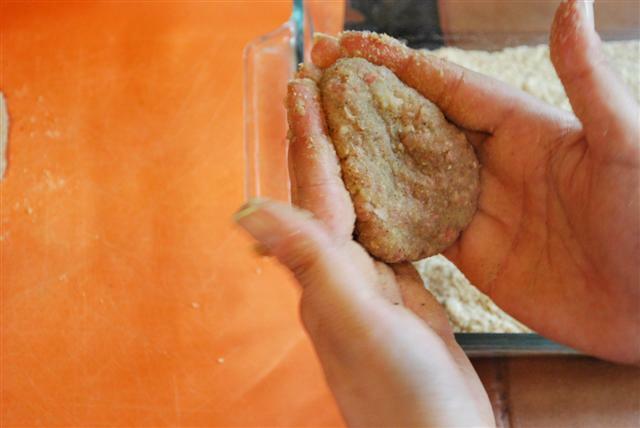 I thought I’d share my little trick for making cutlets. I fry both sides very quickly on high heat, then drain on paper towels (as you suggested) and lay them on a baking sheet and bake at 350 for about 45 minutes. I find that a lot less oil is absorbed that way and they even release a lot of oil in the oven, making them a little more healthy? I have also used a combination of ground beef and ground chicken together, which makes them surprisingly delicious. This is the closest to the recipe to the one I use (in my head), that I learned from my grandmother. The best shortcut for the onion is to add a 1/4 cup of water and put it in the blender with the onion. Make a puree. You increase the breadcrumbs a bit if you need to as a result, but I normally don’t need to. This recipe also very well with ground turkey or chicken instead of 1/2 the beef or even to replace all the beef. And you can even use lamb (although it is stronger than beef). If you like your kotlet a bit spicy add cayenne pepper to the spices. It works out nicely. Oops. Meant to add that I would swap the tumeric and the advieh too. More tumeric and just a small amount of the (very powerful) advieh is what I prefer (with the cayenne pepper add for a little bit of heat). Kotlet always has potato, I totally agree with you. 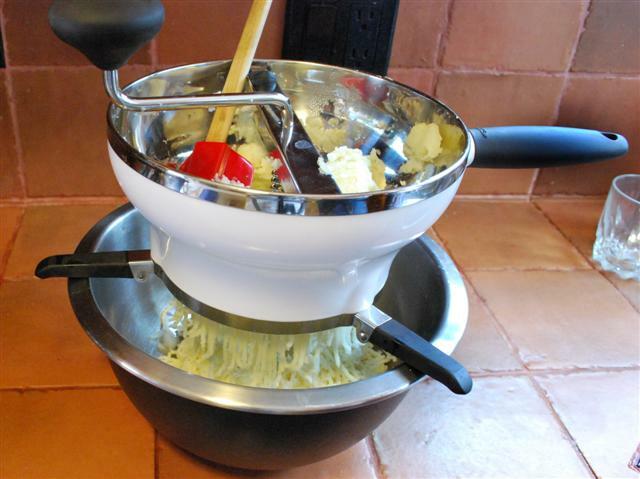 I don’t use a food mill for mine, I just grate it by hand, it works. az babate moarefiye ghazaye Iranian az shoma mamnonam. So excited to find your site. I have been making these since the 80’s when a friend from Tehran would make them using leftover turkey. Will be making the celery stew, too. Love Persian cooking and look forward to becoming familiar with your recipies! In the past, I tried to make kotlet for my daughter who adores kotlet many times but never got the ingredient and measurement right. Your recipe with the instructions was spot on my kotlet turned out very yummy. Thank you for the lovley kotlet recipe. Thanks so much for this great recepie. As a child growing up, my mom always made these — and they are delicious! Especially as left-overs! They seem to get better when they’re left in the frig for awhile! I happened to find your site today.You know the way you talk about Persian cuisine is amazing.It seems you’re writing poem or telling a story. specially when it come to photos i got speechless.They’re water mouthing. Thankful for your site and all the comments! My mother-in-law goes home to Iran for the winters and with all the snow this year my husband is really missing her. No Persian restaurants within hours of us so it’s up to me and the internet to figure out how to make some taste of home to cheer him up! Hey,special thanx for the recipe…. I decied to cook it for tonight,which is a snowy night. I was wondering if I could use a food processor instead of a mixer for this recipe? Thanks. Cathy, I suppose you could but with the dough blade.